There are some things you have to see for yourself, in person. The Azores is that place. It’s that simple. Almost nine million years ago, the earth split open in the middle of the Atlantic and the resulting wound spouted the blood and the fire that created the Azores islands. Far from everything, the Azores turned their back on time and witnessed how the rain and the salt coloured their black lava green with vegetation and life. And they have maintained their quiet essence, adrift at sea, isolated from a loveless world, safeguarding their sublime purity derived from an extinct era. Azores is one of those atypical destinations that is easily forgotten because, despite being a paradise in itself, it’s not a surfing paradise. The islands offer much more than just waves: spectacular landscapes covered in volcanoes, lakes, hot springs, endless meadows and dense, varied vegetation. In fact, the exceptionally rich Azores biosphere reserve is home to mosses, lichens, large leaf plants and tropical flowers in lower areas. The islands are a true work of impressionist art; a sort of multicoloured and diverse collage that no description or photo will ever live up to. There are some things you have to see for yourself, in person. It’s that simple. 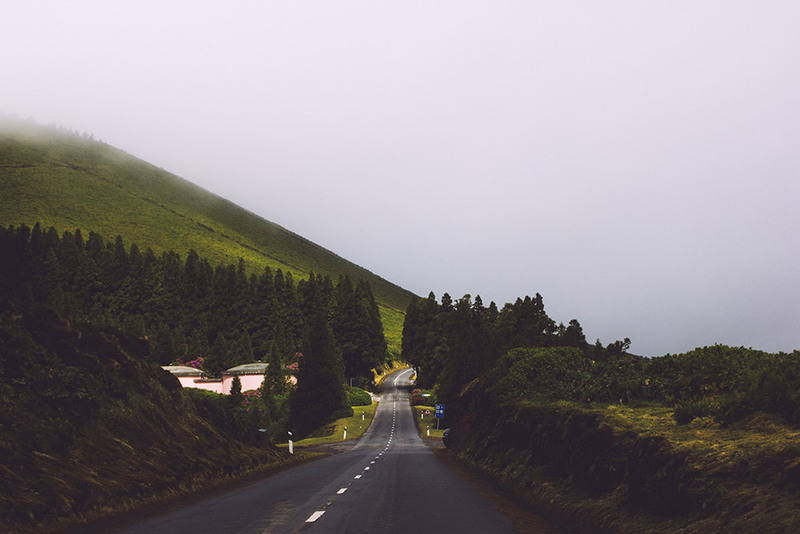 We visited the Azores to get away. To make the most of peace and tranquility far from our world, even if just for a few days. And, where better to escape than the middle of the Atlantic Ocean? São Miguel is quiet and welcoming and has everything you need. The island is small and distances are short. It takes just 20 minutes to drive from coast to coast. What’s more, you can see both sides of the island from one of its peaks. Every corner of São Miguel deserves to be explored: hills, lookout points, volcanoes, forests, lakes… Its beauty is thrilling and infinite. Take a deep breath and feel how São Miguel’s air cleanses your soul. Forget about your mobile phone. Stop. I am well aware that we are all trapped in the ‘click’ and ‘right now’ dynamic. But, if you have made it this far, take some time to appreciate the magnificence of your surroundings. The passing of time has improved the island and made it more beautiful. Repair your insignificance and make yourself big again. Be quiet. Observe. Logout of Instagram for a moment. Fill yourself with memories to keep for later. Take a piece of green island life with you. 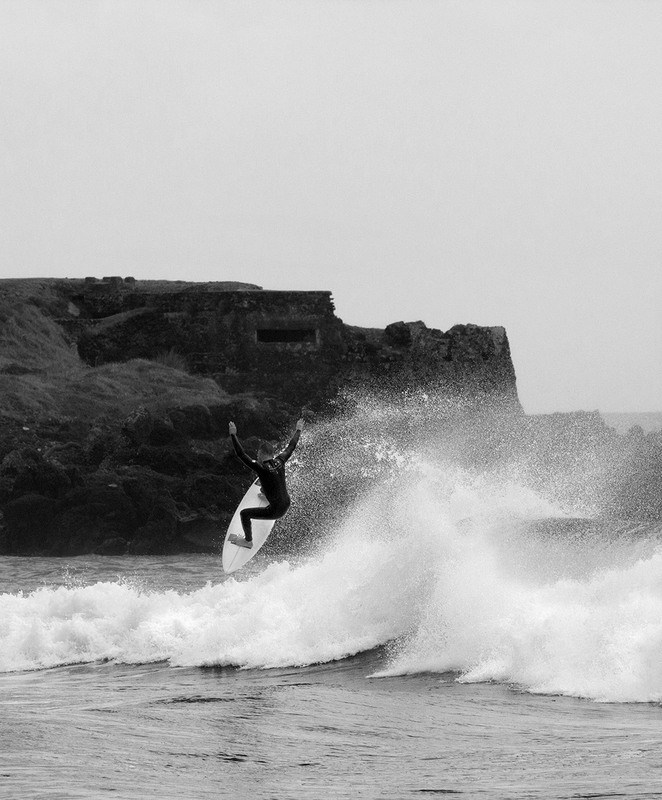 When it comes to waves, São Miguel is not ‘world class’ but definitely offers a few fun options. The southern part of the island is home to beach breaks with variable peaks. These beaches are exposed to southern swells in the summer and are usually sheltered from northern winds. A few rocky bottomed, hard to access points are tucked away on the northern coast. Bringing an extra dose of patience and some hiking boots is a good idea. If it has rained recently, a walking stick will be your best companion at some spots where surfing guides and maps won’t be of much help. 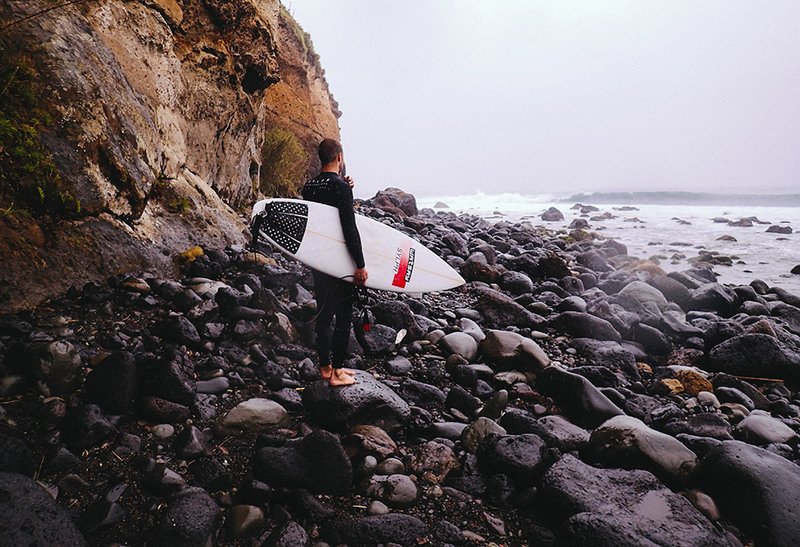 Generally, point breaks need strong, northern swells. And obviously, southern winds are the best. If the right conditions align and you are up for exploring, wear clothes you don’t mind dirtying. Avoid new shoes and keep a round pin on hand, just in case things get messy. Ah, and don’t give up if you get lost. Retrace your steps and try again. 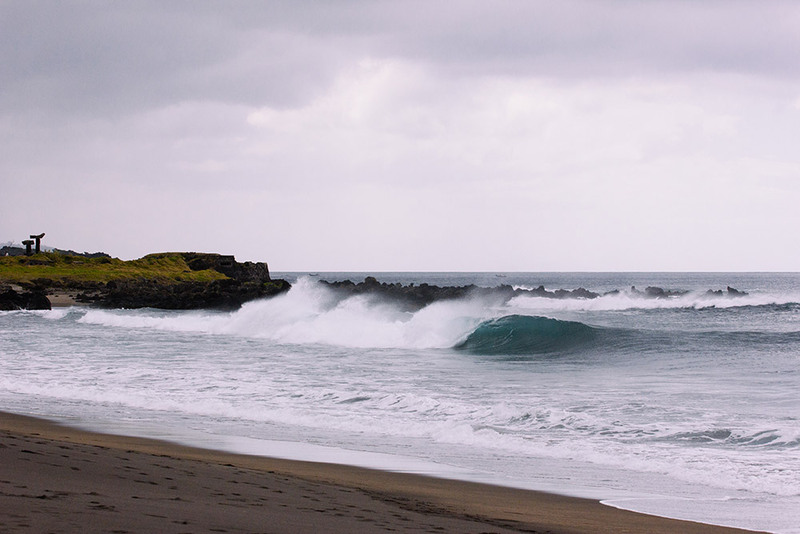 This is what defines surfing Azores. The rest of the waves in the north are in Santa Barbara, a well-known spot for hosting a QS for a number of years. The waves break consistently and are ideal for carving and airs. Don’t give up if you get lost. Retrace your steps and try again. After a good session, sip on a cup of hot tea from the earth, take a dip in a hot spring and I promise, you’ll sleep like a baby. I have always heard that a great trip is defined good company and the charm of the places you visit. This may seem obvious, but I have always been dependent on the quality of the waves, the amount of barrels or the number of photos we bring home with us for publication to define a successful trip. Now that some time has gone by, the weight of my backpack has started to leave its mark on my spine. The rocks are patient and still. After a few rough encounters, I have learned to observe them. If the water is calm they become soft. Others sharpen their teeth in the face of storms and attacks. The rocks never shout or cry, they simply hold their ground, in silence. They blend into the landscape without stealing the limelight. I am not a rock; I am human. That is why I am always in a rush, I am afraid, I get nervous, I feel the uncertainty, I make mistakes and I dream about what the future holds for me. The absolute worst part about not being a rock is that time has taken its toll on me and is quickly taking over my body. The good thing is, that although my skin is soft and fragile, my eyes observe and my legs lift me up. I can walk. And as I love and I suffer, I learn.